As I left my apartment I noticed that there was a slight haze to the air, a bit more than usual, but nothing close to what I would call fog. 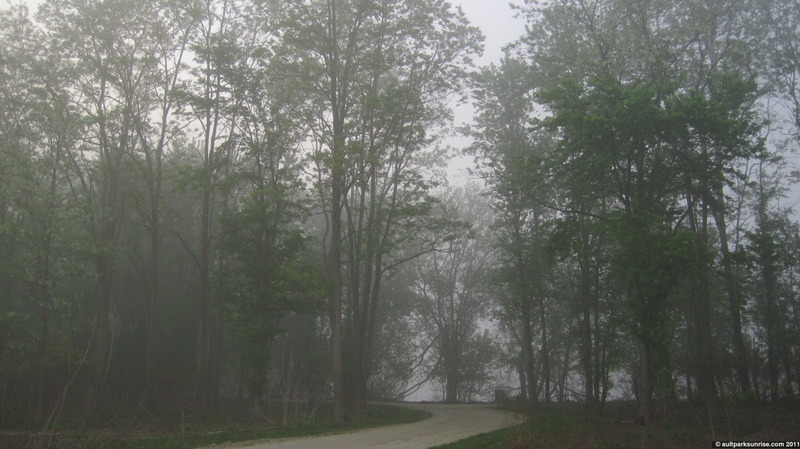 As I approached the overlook, however, I realized that the entire river valley was completely submerged in a thick blanket of fog, no doubt caused by the proximity to the swollen little miami river. 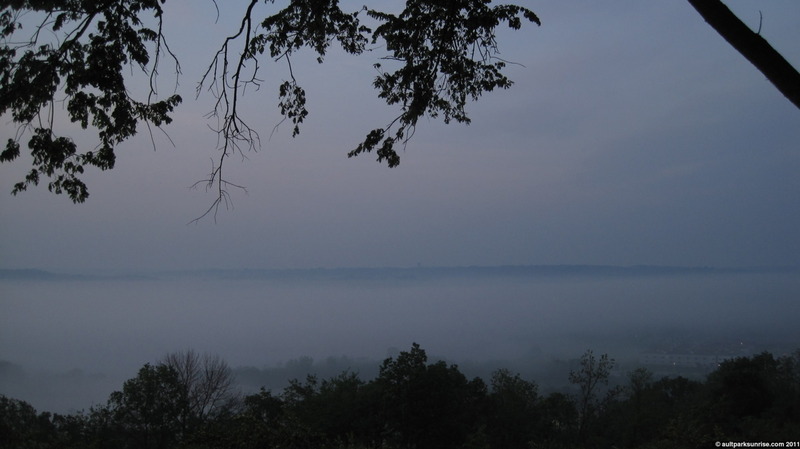 I imagine that the Ohio River is just as foggy and the view from Alms Park would have been incredible. Seeing as how I didn’t have much to look at up at the overlook, and that even the fog was hard to capture correctly without the picture turning out drab and dreary, I decided that it would be a fun exercise to see if I could “catch the fog”, so to speak, by climbing down the mountain (280ft decent over about .8 miles) and attempting to, for the first time, figure out a way to get to Armleder Park on my bike. As it turns out I got sucked back up into some more history, after the historical vineyard ride from Sunday; a trend likely to continue. If you’re on the front page, please click to continue. 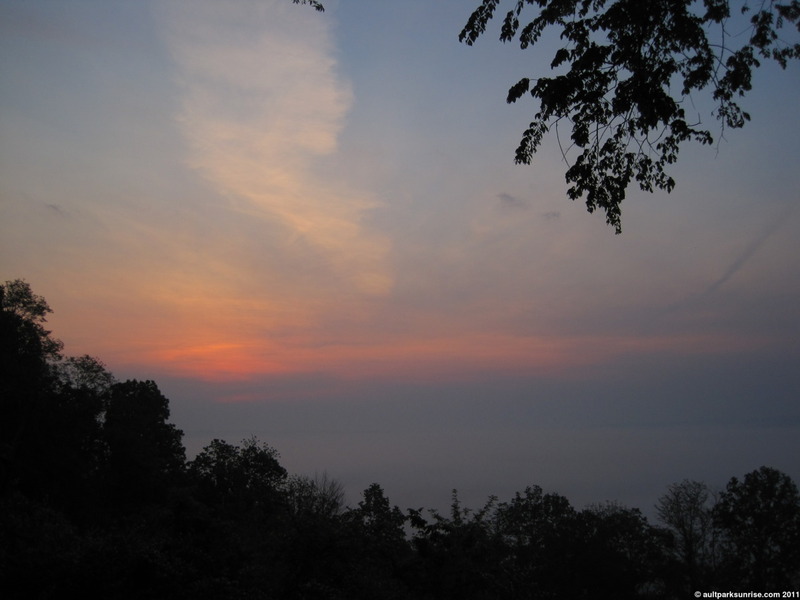 If nothing else check out the pictures after the fog broke a bit – towards the bottom. 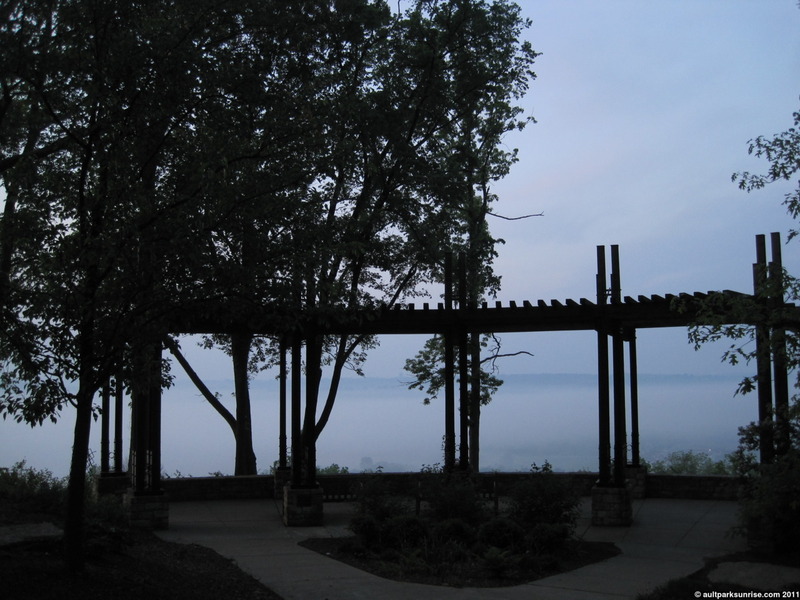 Armleder Park, the park that the overlook looks down into from Ault Park, is nestled on the other side of Beechmont Avenue – a busy freeway I would never try to ride on with my bike. 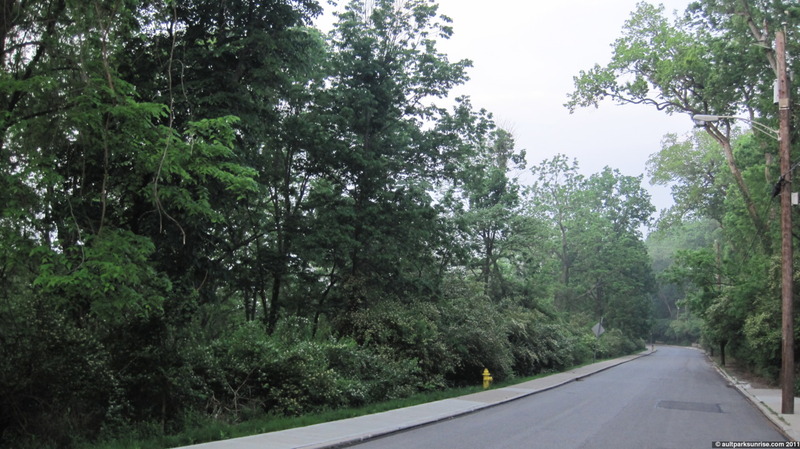 The last time I was driving through the area I observed that there appeared to be a grassy area that connected the lower part of Ault Park to the residential areas next to Armleder Park. It would require me to pick up my bike and walk over some railroad tracks, but it didn’t seem too difficult. It was worth a shot, so off I went. I stopped by Crusade Castle to see if it was foggy. Nope! Looking handsome at almost 160 years old, I continued down through the neighborhood to pop out in an area known as “Linwood”. Before getting dumped out from the hill, I took a picture from the same spot that just three days ago I stood at to observe Lunken Airfield. 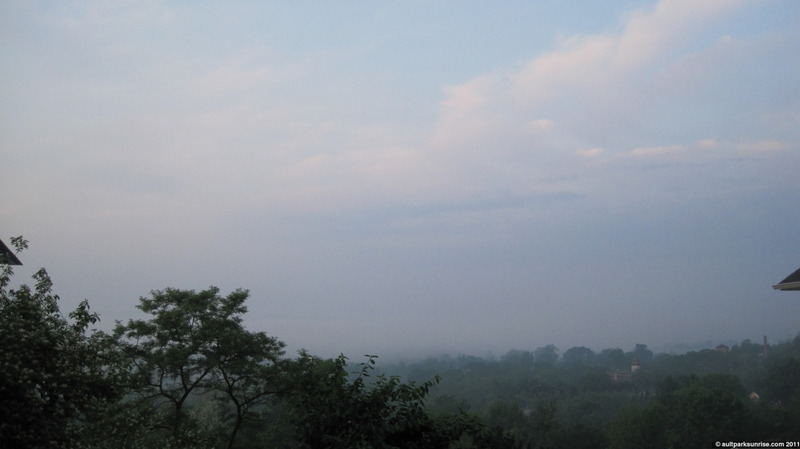 Although it wasn’t foggy where I was standing, Lunken was completely hidden from view. At the bottom of the hill we emerge from the neighborhood into historic Linwood. Linwood is a very small region that sits between East End, Mt. Lookout, and Columbia Tusculum. Back in the day (late 1800s) I’m sure this area, just like East End and Columbia Tusculum, was a booming river town only loosely connected with the city of Cincinnati. 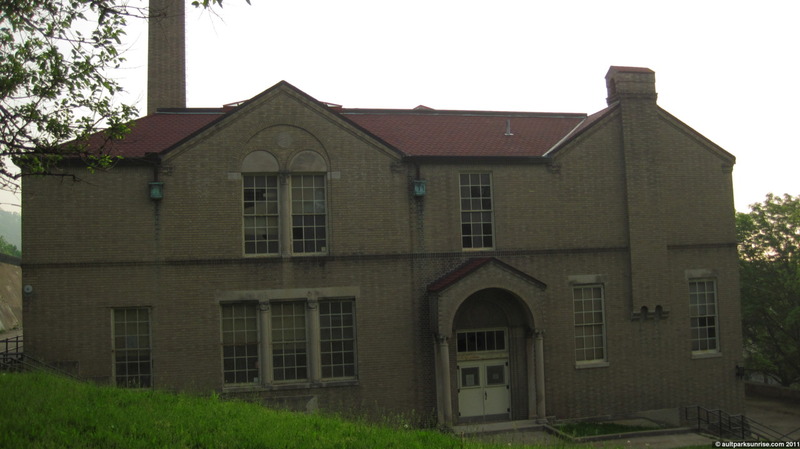 Today, however, the municipal buildings are generally abandoned in favor of office space, and even the local elementary school has moved out. This church was built in 1874, originally as the town hall for the village of Linwood. 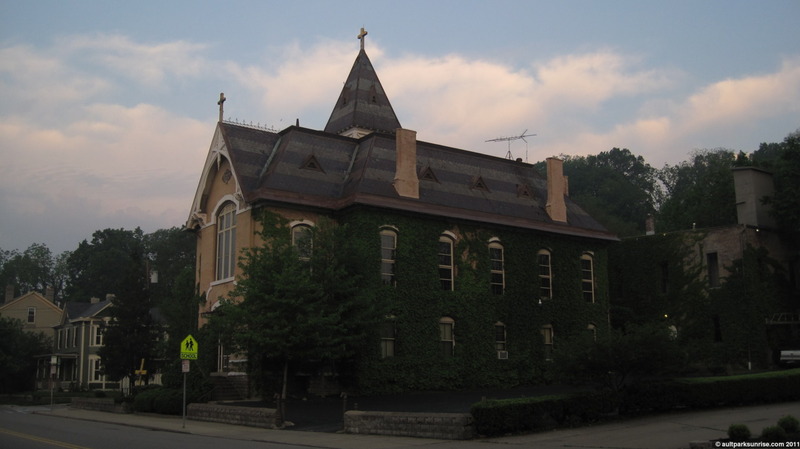 In 1903 it was donated to the Archdiocese of Cincinnati to become Our Lady of Loretta Roman Catholic Church. The church was in operation until 1995. Today it is an annex for the Linwood Baptist Church. Here is a great source, including historic postcards and other Catholic churches that were built in the same decade all over Cincinnati. An old photograph, courtesty of the Cincinnati Public Library. 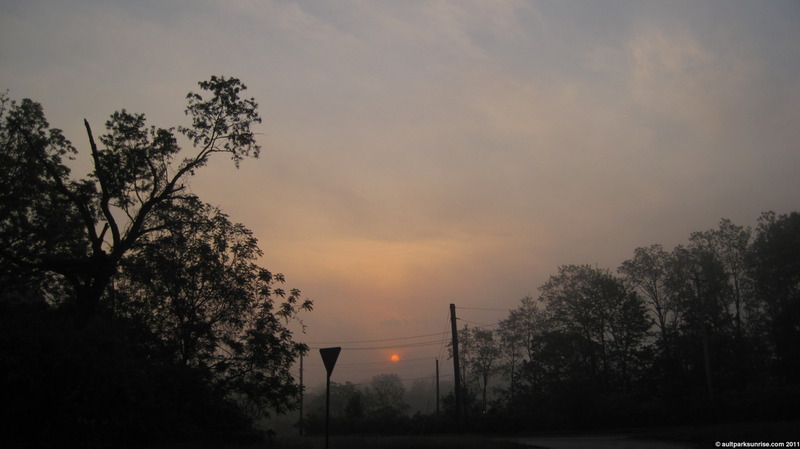 As I rode towards Armleder, I was surprised to see the sun peek through the fog. It only came out for about five minutes before disappearing again. 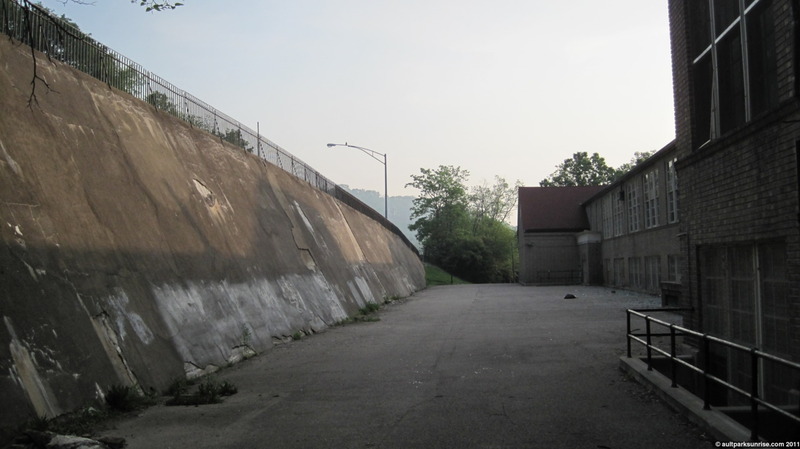 I skipped under the Beenchmont / Columbia Parkway exchange across the old railroad tracks that were no doubt the heart of East End and Linwood sometime in the early last century. You can see that the first track has fallen into disrepair. Here we are looking west towards downtown Cincy. 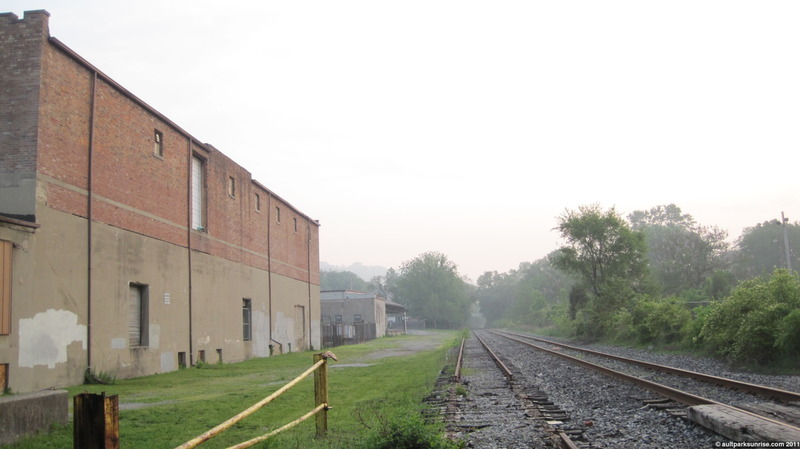 I just realized that this rail track (on the left) and the two rails that those cars are sitting on end up going all the way to downtown. Eventually two of them fall out and disappear into gravel, leaving one remaining that runs all the way to the Cincinnati Reds stadium. Once you get into the downtown area the rail has been filled in with concrete, making a smooth biking and running trail that leaves the rail exposed. You can see a bit of it in the pictures I took when I went down through East End and raced that barge. 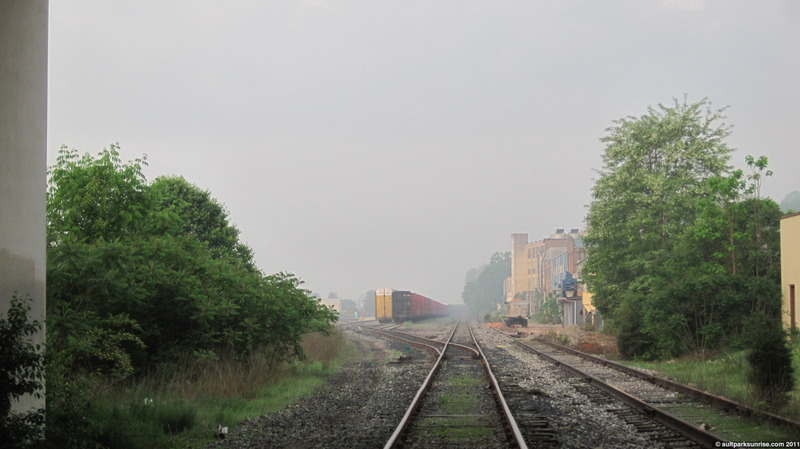 One day the entire rail line will be converted into a bike trail that will connect downtown to Lunken Airfield, and eventually to the Little Miami trailhead that you can take all the way up to Dayton Ohio – the longest paved trail in the country. Not that great of a picture, but now that I can post these “for free” I might as well! The sun disappeared behind the clouds just after I took the shot. 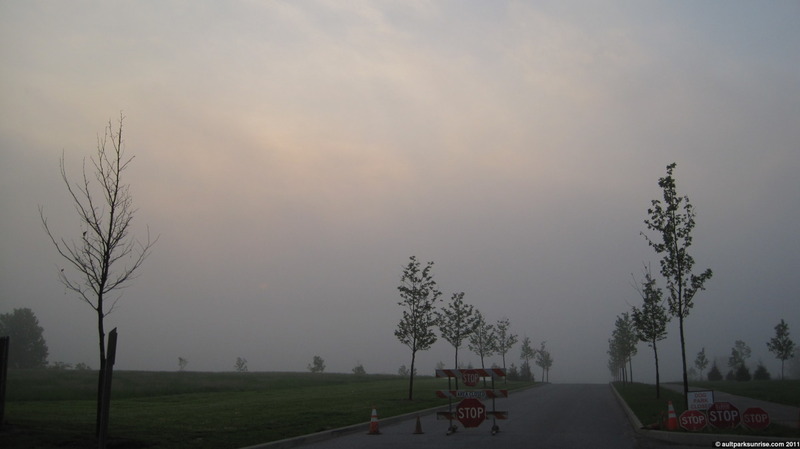 The entrance to Armleder Park. Normally you would be able to see the shelter from here, only about a quarter mile up the road. I have found the fog! Just a week and a half ago this entire park was under water. I learned from a park crew member yesterday that the reason the park seemed to “dry out” in just a day was because of the brilliant engineers down in Missouri. 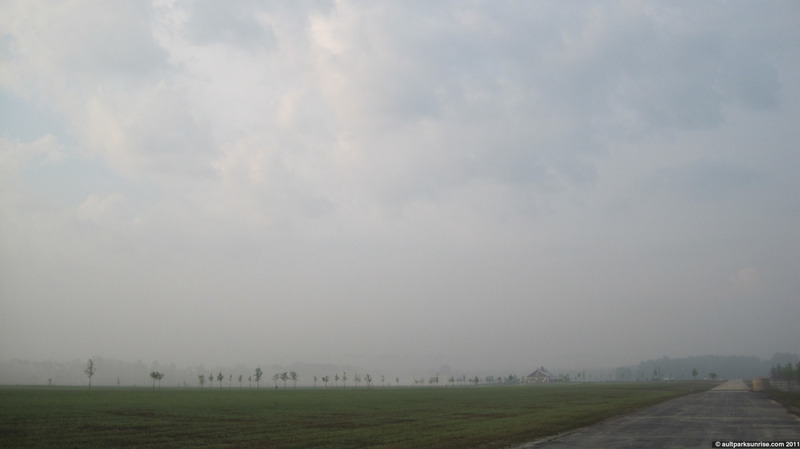 A local town was going to be flooded if the levees broke, so they blew out another levee to flood the farmlands instead. This drained the Ohio River and dried up Cincinnati overnight. I knew something was up, but I had no idea the water receded due to events that happened hundreds of miles from here. 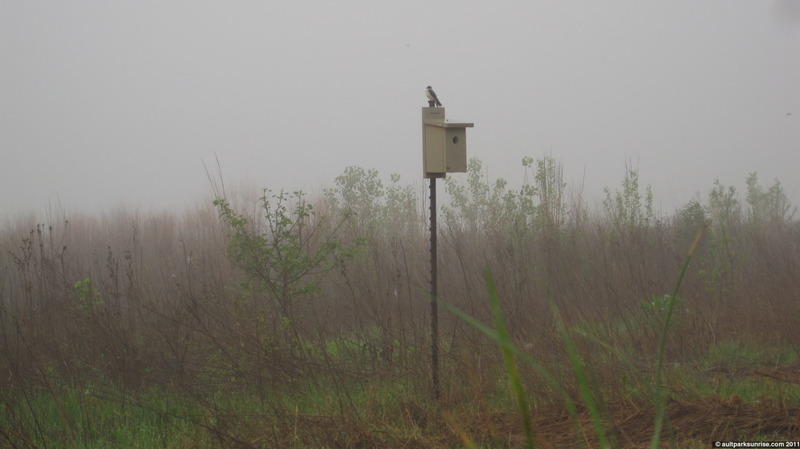 Side view of the shelter, covered in fog. 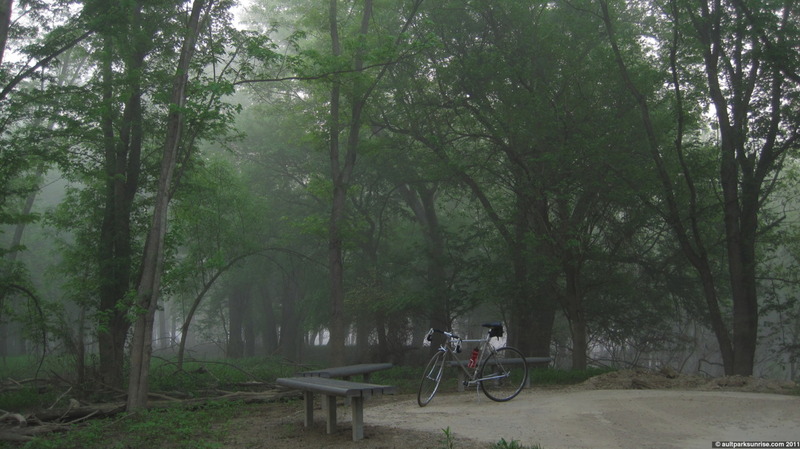 I rode through the prairie to the back part of the park, where there is a small off-shoot from the 2 mile trail loop. This is my favorite part of the park because in the summer the trees provide a beautiful private pocket, complete with a few benches and a bike rack. You can also access the river, although currently it is just a few feet below the top of the banks. This looked much less attractive about a month ago with all of the flooding and the naked trees. You can see where the water level was just two weeks ago. The plants seem to be recovering well, there was lots of green new growth and the prairie grass didn’t seem to mind being underwater. I had thought about drinking my coffee here, but the mosquitoes were kind of awful. Not to mention the animal tracks I was about to run across which gave me the creeps. Ahh, yes. Fresh animal tracks. 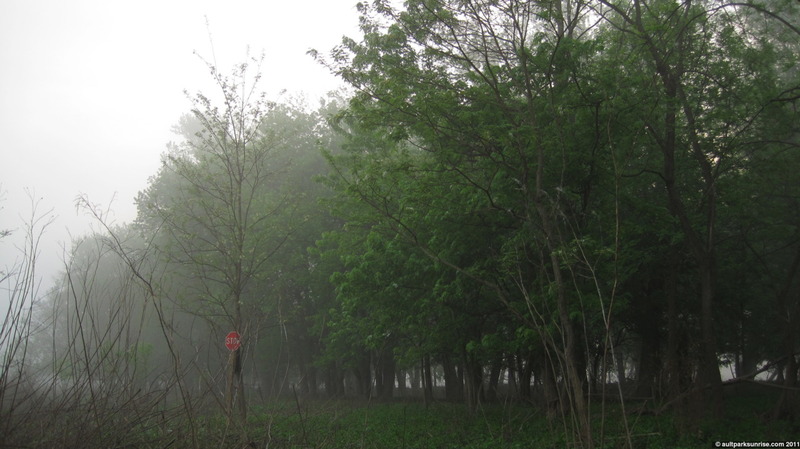 Raccoons, deer, squirrels, birds, and… canine. Huge Canines. No human footprints around, so they are definitely feral. Most likely they are coyotes; there were several tracks of varying sizes indicating they move in a pack. 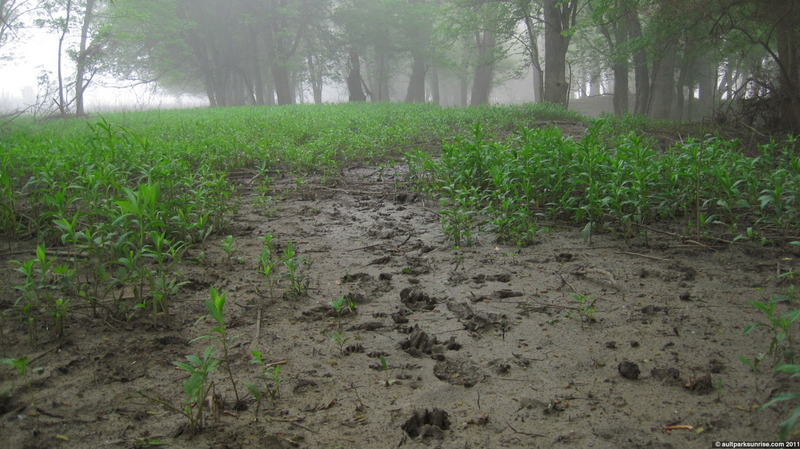 I found some tracks up in Ault Park a few weeks ago and they really can be intimidating. My trusty LG-9900 ENV for comparison. Once you see the coyote tracks you kind of get the feeling that they’re watching you from the bushes. These tracks are huge, right? 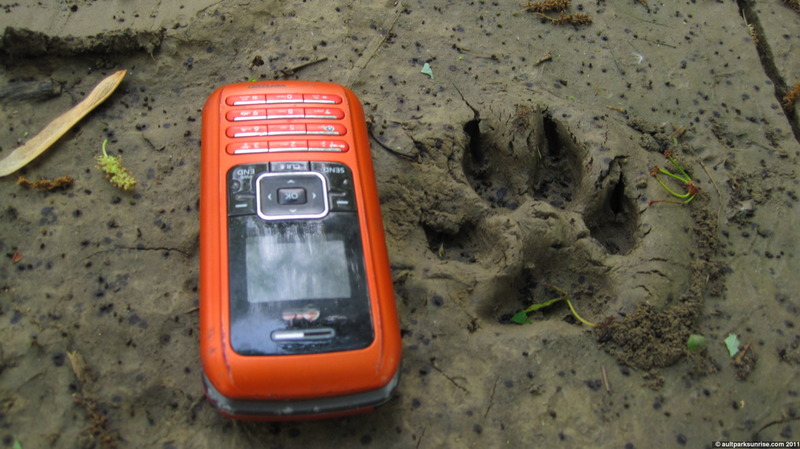 These aren’t fox tracks, thats for sure. I’m guessing around 3.25″ long, compared to 2.5″ on average according to the previously linked website. A victim of the flooding.. that is a stop sign in the middle of the prairie. I think it was picked up by the park crew and set there for future work. A prairie bird, dark metallic blue. Favorite shot of the day. My bike, the sun, and the open road. This is the small fishing pond on the side of the park. 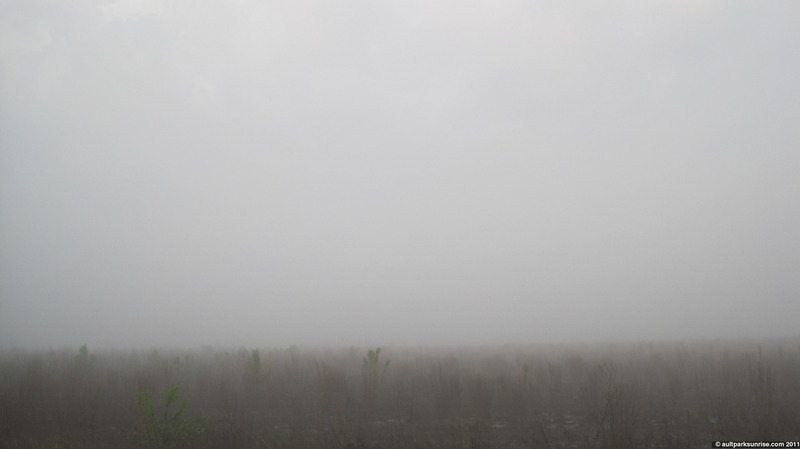 I predict there are giant fish in here that got trapped by the sudden weather decline when the prairie drained. 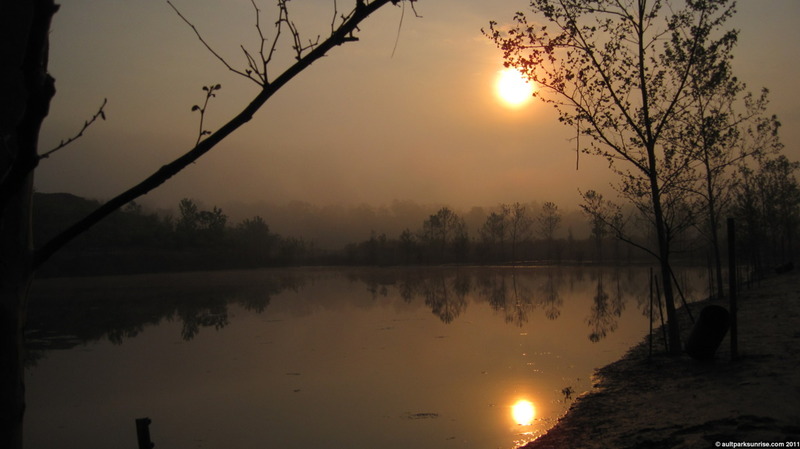 Carp and catfishing anyone? 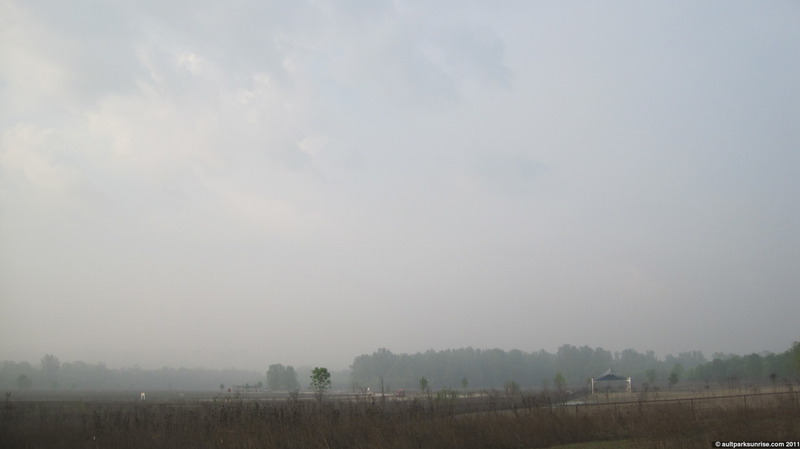 As the sun came out, the visibility increased. You can see the dog park on the right. It is likely closed, but it is at least drying out. The park is technically closed so that they can work on the grounds, but the bike trail is clear and dry. The Armleder Dog Park will likely be closed for at least a couple of days until the mud dries out. If you look real hard, you can see Heekin Overlook on top of the hill. The Crusade Castle Vineyard is up there, too, but you can’t really tell with the tree blocking the view. 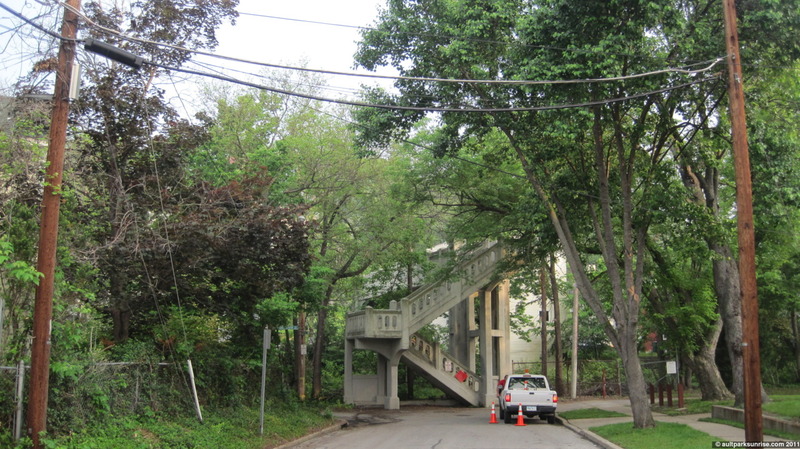 I took an alternate route home – a pedestrian bridge that brings you up to Eastern Avenue. These are scattered all over Cincinnati, especially by the Ohio River – it is nice to see one that is maintained and not closed down or in ruins. As I approached the stairway I realized that there was an entrance to “Linwood Park”. I had no idea! I don’t even really know where I am at this point, so finding a Cincinnati Park down here was a great surprise. 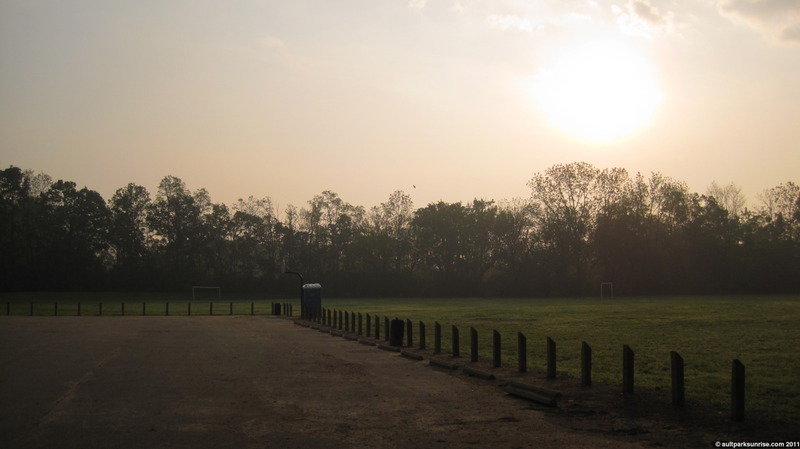 Nestled and secluded by the surrounding forest, there are several soccer fields and a swing set. I passed this school on the way to the park, making a note to check it out on the way home. 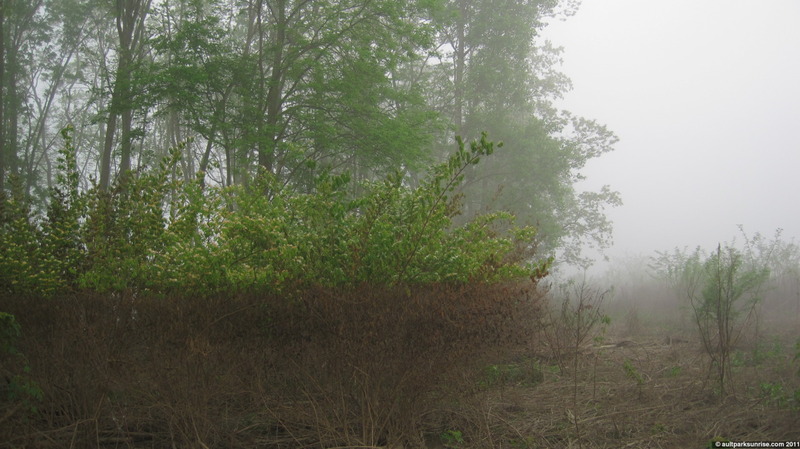 The bushes are overgrown and it doesn’t look like there are any kids here. 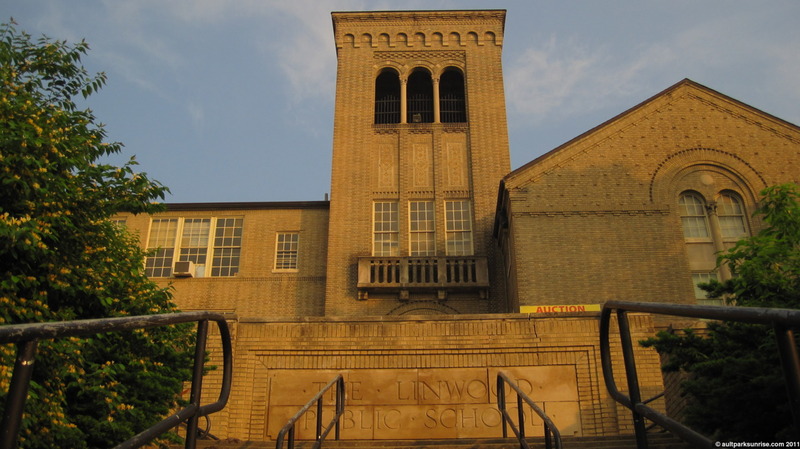 The school proudly proclaims “Linwood Public School”, however it appears to have been abandoned recently. There is an “Auction” sign posted on the front of the building stating that there will be an auction in June, but it doesn’t say the year. 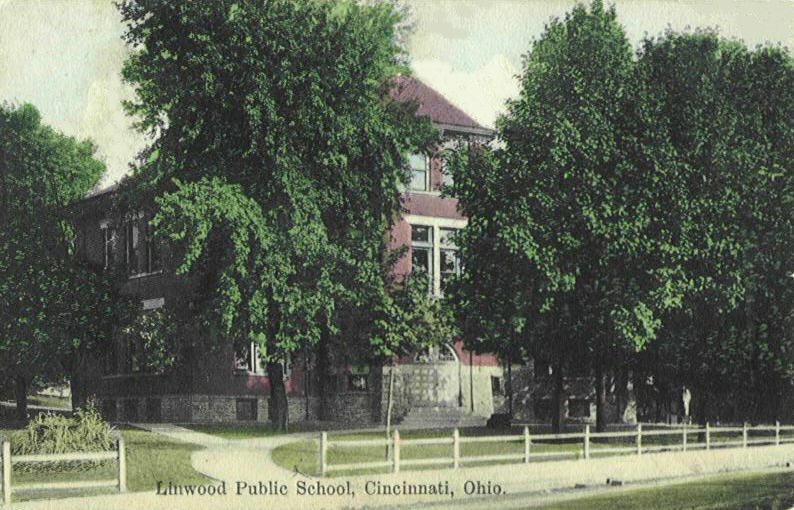 I googled around a bit for information on the Linwood Public School, but it was very difficult to track down. It is not referenced on the Cincinnati Public Schools wikipedia page or Cincinnati Public Schools historical page. I finally found a real estate listing for the property that states that the building was established in 1900. That fits in perfectly for the “East End Boom” period that I’m starting to piece together. The school was definitely used as recently as 1987-1989 because they still have the plaques on the back of the school when it received the “Merit Award” from someone. 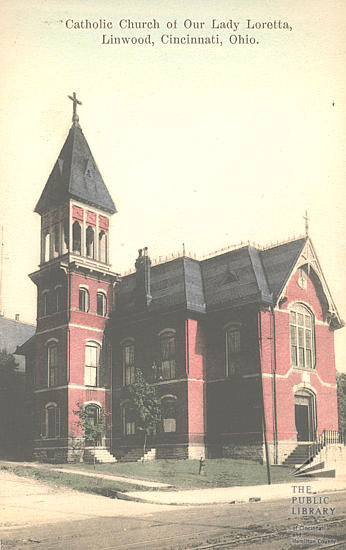 There is also an interesting historical postcard from Cincinnati Views’ School Page that shows the school sometime earlier in the last century, although I can’t exactly tell what angle the photo is taken at because it doesn’t look like the building in its current state. 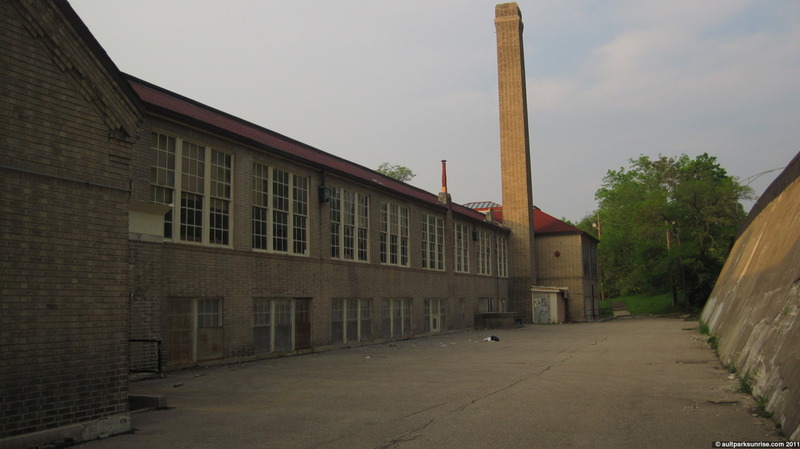 The back of the school, including some broken windows and the smoke stack for the furnace. 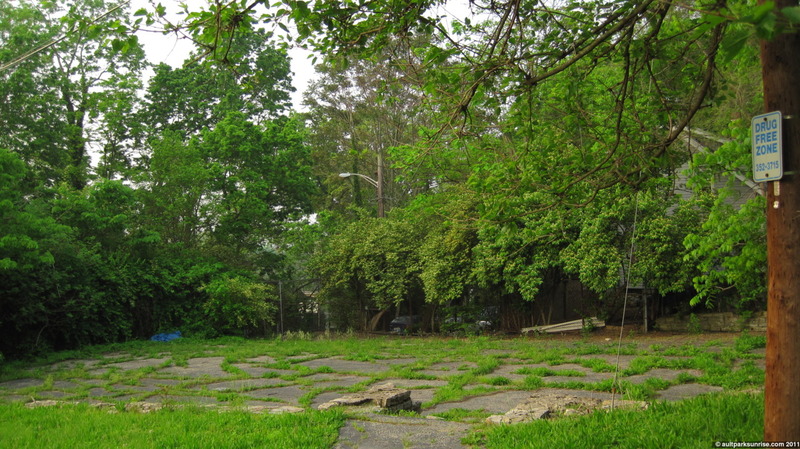 Perhaps an “ancient” basketball court? 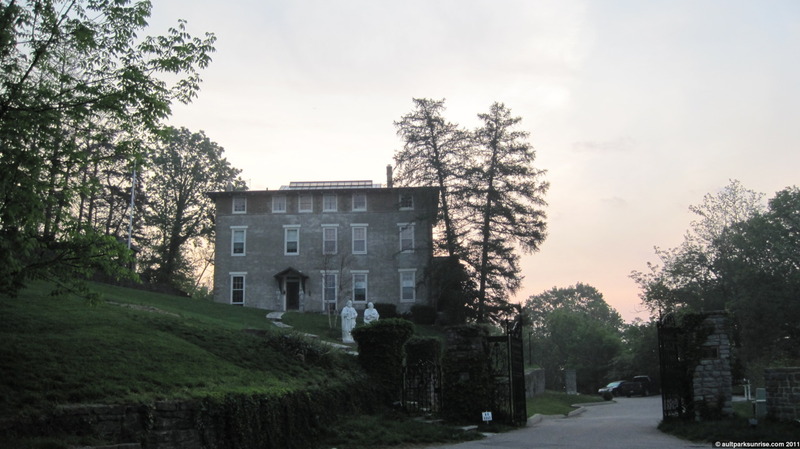 The side of the building, showing the Italianate columns and gray brick with red roofing. 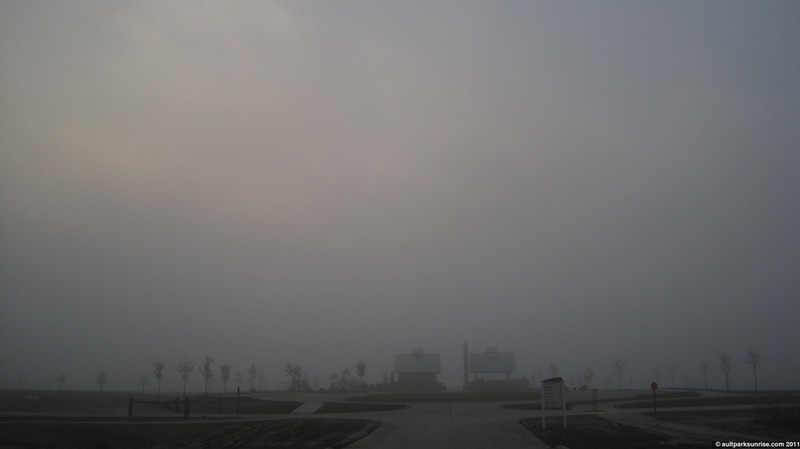 The grand courtyard in front of the school. 😦 Notice the “bell tower” up above. 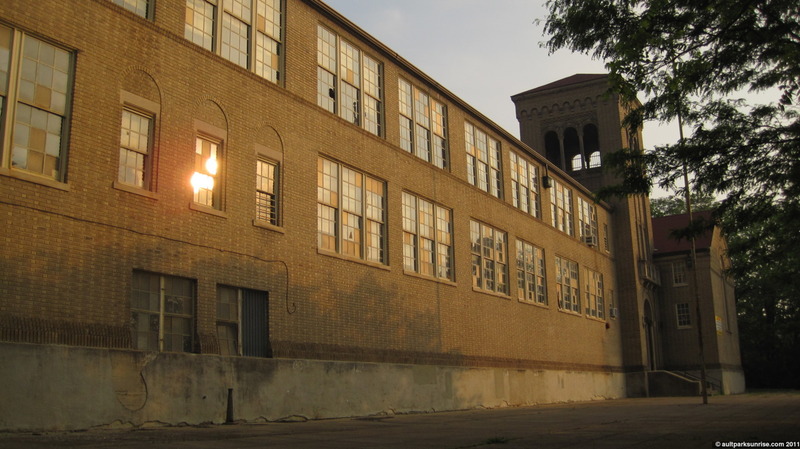 Looking at the school from the front. I almost walked right by this sucker. 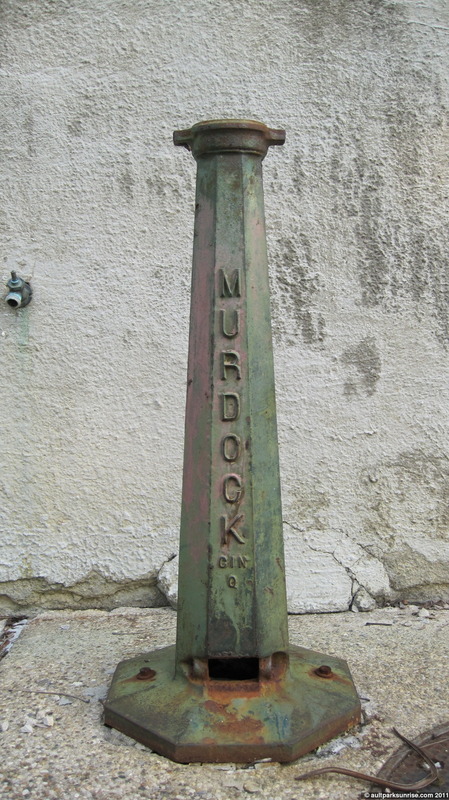 I’ve been noticing these Murdock fountains all over town. There is one in Ault Park, Alms Park, and several other parks along with downtown. I even saw them down in Asheville, SC on our visit last summer. They’re made in Cincinnati and they’re made to last. As it turns out the company is still around (although they’ve since moved out to California) and they still make their fountains, including the ORIGINAL Murdock design from 1776 – meaning you can order original parts to repair them. Amazing! Visualingual was the first google result for “Murdock Fountains” where there are some great pictures of a fountain downtown and out in San Fransisco. 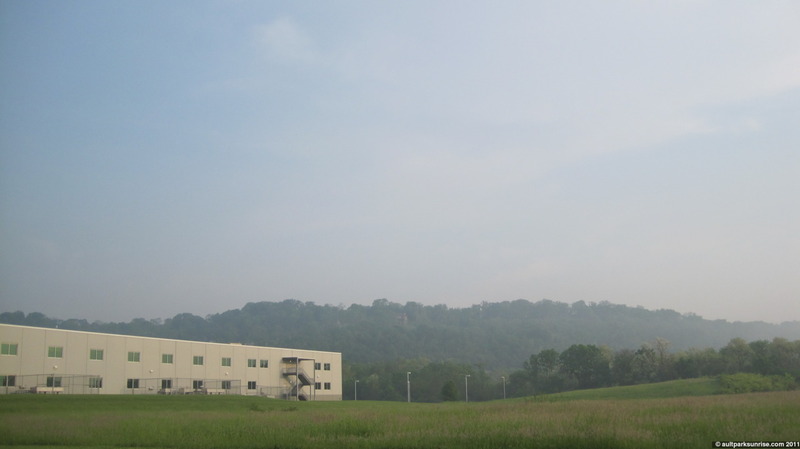 The company’s website history page has some good information, and it appears they were originally located on River Road (thats what I take to get downtown on my bike, about two miles from where this picture was taken). I’ll have to go find the building and see if it is still around. What a relief, finding an “artifact” of the turn-of-the-century generation that is still around today! A positive note in this dreary abandoned school lot. So many of the “ruins” I find around Cincinnati are associated with a period that has so few living threads still connected to our modern world. I emailed the company asking if it would be possible to date their fountains. They put me in touch with Bob Murdock, a fifth generation Murdock still working with the company who can date the murdock fountains based on their subtle design changes throughout the years. I’ll see what he thinks of this murdock fountain. 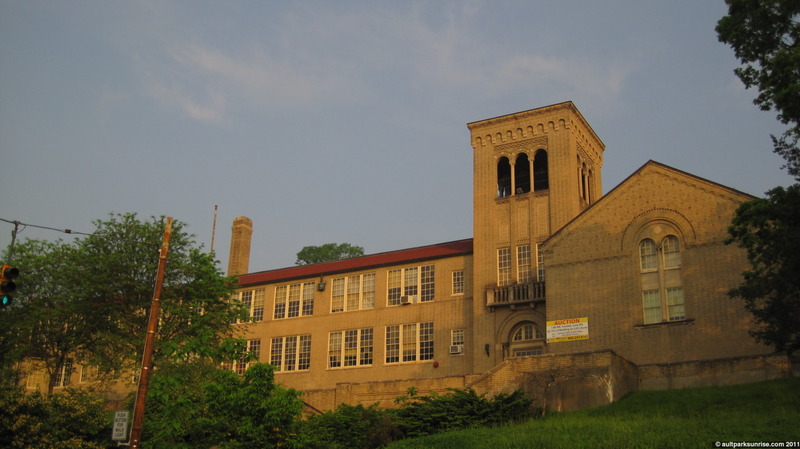 A final shot of the back of the school; Columbia Parkway is very loud up on top of the embankment to the left. Just a reminder to anyone biking in Cincinnati, this weekend is Bike+Brew – the bike month pub crawl! Check it out, events start at 01:00pm @ Findlay Market! 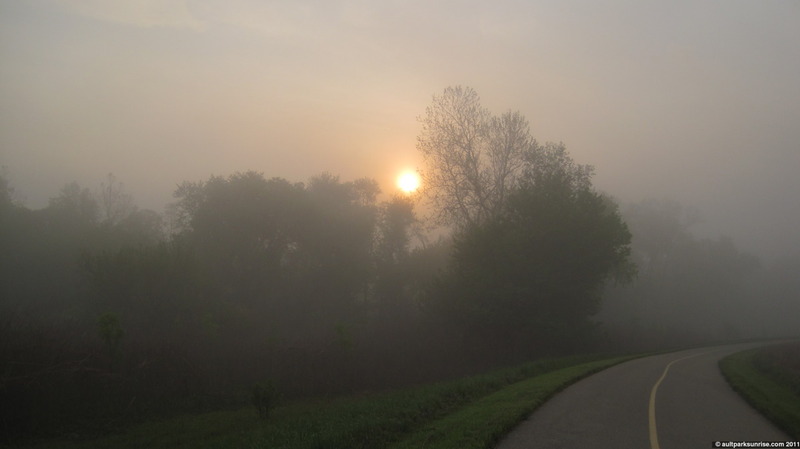 This entry was posted on May 12, 2011 by Ault Park Sunrise. 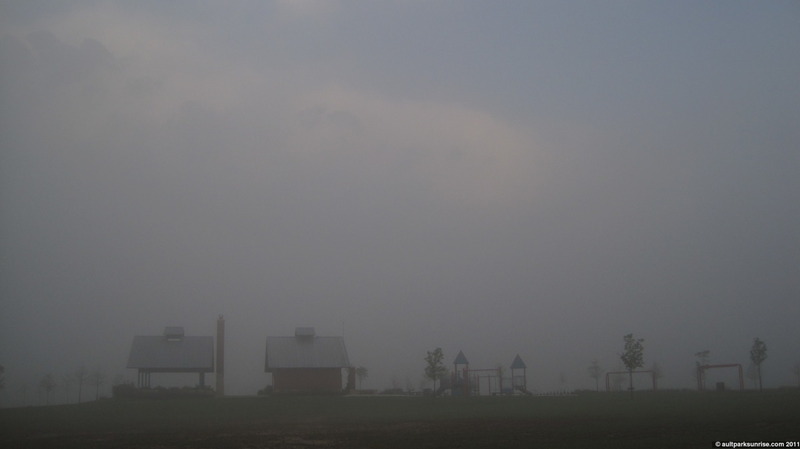 It was filed under armleder park, ault park, civic buildings, foggy, history, linwood, mt. 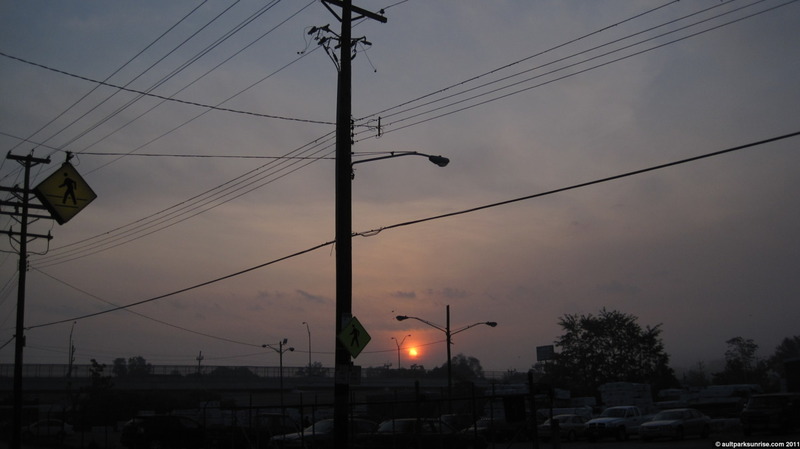 lookout, sunrise, vineyards and was tagged with armleder park, ault park, catholic churches, cincinnati, cincinnati public schools, coyotes, fog, history, linwood, murdock fountains, our lady loretta, sunrise. Another interesting historical post. If the canines didn’t carry you off, then the mozzies would eh?! ha! thanks! haha i had to google “mozzies”, and you’re quite right. We’ve got this invasive asian species “Asian Tiger Mosquito” that showed up sometime in the last decade. they’re really aggressive and get kind of huge. They come out in the day and are mean little suckers. There are so many interesting things in this post, thanks Blaine! The pictures of the railroad tracks whipped my brain back to childhood. I remember walking tracks with my sister looking for marbles. I never did know what they were doing there so your post prompted me to look it up. So odd. You never know where your day will take you. Another mystery solved, thanks! Tara, that is awesome. We used to hunt for little black smooth pebbles – either stone or steel not sure which – but I never heard of the glass marbles. I wonder how many you can find today? Now I’m really curious… if you were to find them today it looks like they’d be over 120 years old! Its bike week here in cleveland hts. We will have a bike brew as well. 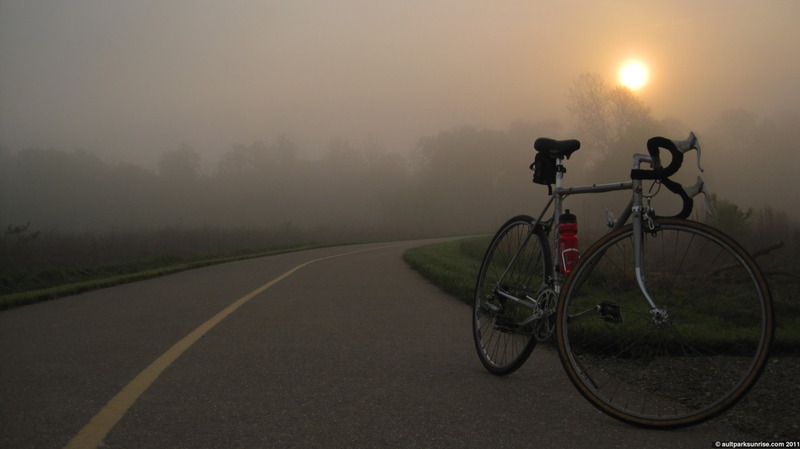 Also this wed is the ride of silence to bring awareness to bicyclists as well as mourn the loss of riders from traffic accidents. may is a good month! you doing the bike and brew up there? curable to spread quickly through communities. There are a few do’s and don’ts when it comes to condoms. how often he socializes, with whom and how many alcoholic beverages per occasion.